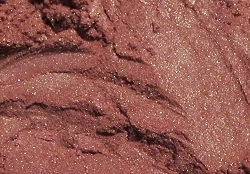 Ruddy deep pink with copper-gold shimmer throughout. The shimmer is very noticable, but not sparkly. Applies more pink than it appears here. Not eye safe.